Make transporting and displaying your jewelry merchandise easy and affordable with our Linen Display Trays. 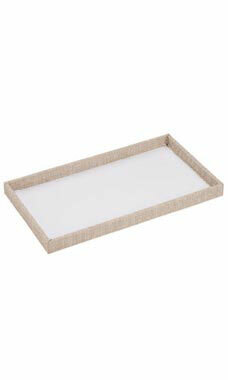 Our tray features a linen fabric covered outer finish and white paper lined inside. All of our 14” jewelry inserts work beautifully inside of the trays. This will allow for display, organization and transport of all sorts of jewelry merchandise and components. The trays can be used inside our jewelry carrying cases.